Produced by Lee Marcus & Cliff Reid. Story & Screenplay by Jerry Cady. Film Editing by Harry Marker. Art Direction by Van Nest Polglase. Special Effects by Vernon L. Walker. Miss Francis’ Gowns by I. Magnin & Co.
Other Wardrobe by Edward Stevenson. 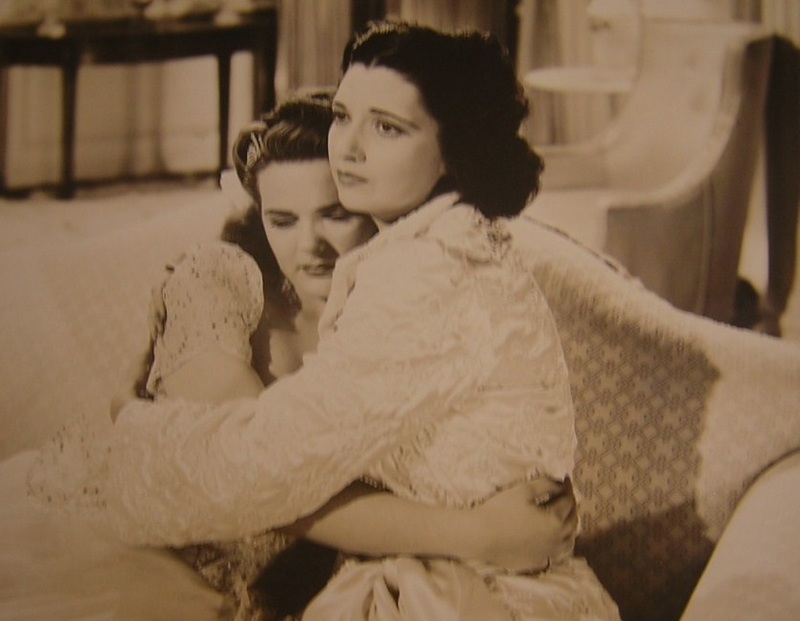 For her first release of 1941, audiences saw Kay Francis in a small little bit of fluff titled Play Girl. Today, the film becomes worthwhile for several reasons. One is because this is the type of movie Kay accelerated so well with in the early 1930s, most notably in George Cukor’s Girls About Town (1931). It’s a reminder of her wonderful Pre-Code career which was cut short far too soon. The second reason is because this is Kay Francis accepting her age, unlike her contemporaries who seemed to be running from it. While the film is clearly no Philadelphia Story (1940; with Cary Grant and Katharine Hepburn) or My Favorite Wife (1940; with Irene Dunne and Grant), Play Girl does have its funny moments, most of which come from Margaret Hamilton as the wise-cracking maid to Kay’s glamorous gold digger. It was also the first of the unintentionally unfunny comedies which headlined a fading female star. Soon Greta Garbo was given a major promotion in a dud titled Two-Faced Woman (1941). Norma Shearer headlined two losers called We Were Dancing and Her Cardboard Lover (both 1942). And Joan Crawford replaced the late Carole Lombard in a piece of dull fluff titled They All Kissed the Bride (1942). Like the other stars of those unremarkable films, Kay Francis had clearly passed her prime by the time Play Girl was made and released. But one thing that set Play Girl apart from the rest was a spark which the British Press condemned as “unmoral.” The plot revolved around a down on her luck glamour girl who is in desperate need for money. She takes a young ingénue under her wing to benefit only herself financially. To some religious critics at the time, Kay’s “lessons” for Mildred Coles borderline prostitution. She teaches Coles to use her “charms” to get the big bucks from men who don’t want to spend it. Ten years earlier, this could have been the perfect vehicle for Mae West. What got the film by the Legion of Decency in America was the fact that it was a glorified programmer from RKO. Kay’s only punishment in the plot is time, which can not be reversed to obtain the beauty of youth. It was enough for the PCA to get this movie done and over with and focus on bigger issues. Unfortunately, it seems as if RKO had that same attitude about Kay, who had completed three movies for the studio as a free-lance actress. Play Girl was the final movie she made for them. “After Play Girl,” biographer Scott O’Brien wrote in Kay Francis: I Can’t Wait to be Forgotten, “Kay’s career definitely needed another shot in the arm. It was soon and forthcoming.” Her other releases of the year, The Man Who Lost Himself, Charley’s Aunt, and The Feminine Touch, provided Kay with the suitable comedic material needed to express her talent as an actress. Below: Kay and Margaret Hamilton showcase their comedy skills as the real “charms” in Play Girl. Opens with credits included as notes on luxurious gifts. The first scenes are in Lake Placid, and we see a montage of skiing and winter sports, none of which include Kay, who makes her appearance looking beautiful in ski wear which makes it clear she hasn’t stepped foot in the snow. Grace has been romancing Don, a younger man who is an obvious target to manipulate.Don’s father arrives at Grace’s room, and tells her that their engagement is off. He works for the New York Evening Chronicle, and has gone over her lengthy past with breach of promise suits; she romances men, gets them to spend enormous amounts of money on her, then files a law suit against them claiming that they had given her the idea of marriage only to take it away. It’s all a bunch of bull to get money without having to work; clearly people haven’t changed. Everyone’s always looking for ways to get ridiculous amounts of money without having to do everything. Unfortunately for Grace, however, her luck is beginning to slip. She has only $1,500 to her name, and decides to go to Florida to pick up on naïve young Southern “gentlemen.” A montage of games, dinners, and newspaper titled follows. “What’s a gal to do when she’s past thirty…?” Grace admits when realizing her age is beginning to limit her abilities to attract men. To get a little extra money, she has to sell a pin “Prince Michael” gave to her for “$25,000.” Clearly it couldn’t have been that much, because she willingly accepts $6,000 for it. Ellen Daley arrives at Grace’s room physically and emotionally exhausted. She’s an orphan, and looking for secretarial work. Grace decides that with Ellen’s age and looks combined with Grace’s years of experience, they can swindle loads of money from unsuspecting men. She’s hesitant at first, but agrees to follow Grace to Chicago. In the car on 52, the girls get a flat tire. Josephine, Grace’s personal nurse, makes a few sarcastic comments to pass time until a train pulls up. Tom Dice decides to help them, and he’s taken with Ellen and she with him. Since he’s a cowboy, Grace automatically suspects he’s a loser and tells Ellen not to waste her time, but she can’t keep her mind off Tom anyway. Grace rings on William McDonald, an older wealthy man who has known Grace for years. Back in the day, it was Grace who was able to get the money out of Bill, but now she’s got to use Ellen’s charm. A car, fox fur, flowers, and false intentions later, Grace tells Bill that he’s left Ellen heartbroken. Ellen was “so sure” that Bill wanted to marry her, and is going to file a breach of promise suit against him for $50,000. They settle for that sum outside of court. They’ve got their first victim down. “And all you did was kiss him goodnight,” Grace reminds Ellen, who’s more interested in finding Tom in Chicago. Grace has Ellen swindle auto manufacturer Van Pasen next. Attending a symphony with him, she sees Tom, and agrees to meet him later. Ecstatic to find out that loser cowboy is really work $11 million dollars, Grace insists that Ellen marry Tom right away. “This ruins everything…” Ellen goes on, and leaves Grace the following morning because she can’t use him the way Grace wants her to. Back on her own, she decides to manipulate Tom herself, dusting off her old charms and experience and getting as far as en engagement with the boy who’s especially younger than herself. Out of nowhere one morning, Tom’s mother arrives at Grace’s apartment. She’s sincere in saying that all she wants is the best for her son, and that is whatever will make him happy. If marrying an older woman—who’s old enough to be his mother—is what will make him “happy,” then she sees no reasons why Grace can’t be with him. It’s only then we see her heart start to emerge, and then Tom arrives at Grace’s apartment, she tells him that it’s obvious he’s still in love with Ellen, and tells him that she really did love him and ran away because it frightened her. She gives Ellen’s location away, and tells Tom to run off and marry her as soon as possible. Realizing how kind Grace can really be, Tom’s mother sets Grace up with Tom’s uncle, who’s even richer than they are and needs someone to settle down with. Grace jumps at the chance, and tells Josephine that this really is the “last time.” She’s decided that it’s time to marry and be a wife. Kay is beautiful throughout the entire movie. There’s not one flaw to her appearance; her hairstyles are exceptionally well and she’s gowned as good as in any of her Warner Brothers films. Her performance falls somewhat between Girls About Town and Allotment Wives. The first because she’s using her beauty to obviously distract men into spending ludicrous amounts of money on her, and the final because she’s a social climber. Kay’s Grace seems to have a hidden amount of street smarts underneath those designer hats and hairstyles. Clearly most remembered as the Wicked Witch of the West in The Wizard of Oz (1939), Margaret Hamilton really showcases her ability as an actress in this one. It’s the complete opposite of her evilness in Oz; she’s charming, funny, and shows the talent for being a comedienne on the level of Polly Moran or Marie Dressler. Too bad she became identified only with that role, even if it has preserved her memory far better than an entire career preserved Kay’s. Nigel Bruce does a great imitation of Kay’s speech impediment when he realizes he’s been milked for money by Grace: “If you weally weally want to do something nice for [Ellen], I’ve seen the most gorgeous mink coat. I’m sure Ellen will be wild about it.” As Ellen, Mildred Coles varies somewhat between Teresa Wright and a young Debbie Reynolds. Her brief career included only twenty movies, most of which were low-budget Westerns. Interestingly, James Ellison made his movie debut in Play-Girl (1932), which starred Loretta Young and Winnie Lighter. He had a career as usually the best friend or young naïve all-American type in smaller movies such as this one. Play Girl is a good movie, but one without much excitement or suspense. It should be seen really only by fans of Kay Francis, who dominates the film from opening to closing. As a chapbook on the technique of gold-digging, “Play Girl,” now at the Palace, is a listless comedy on a dismal subject. A distaff version of a rake’s progress, it finds Kay Francis as superannuated gold-digger who tries to compensate for her failing charms by teaching the tricks of her trade to a winsome young novice. As might be expected, said novice (in this case, Mildred Coles) falls in love with an itinerant cowpuncher (in this case, James Ellison), and the resultant conflict between love and a career, so to speak, is considerably less than heart-breaking. As it happens, the cowpuncher is discovered to have his pockets lined with an odd $11,000,000, so that makes everything just dandy. But somehow, we couldn’t learn to care very much. Published in the New York Times, January 30, 1940..